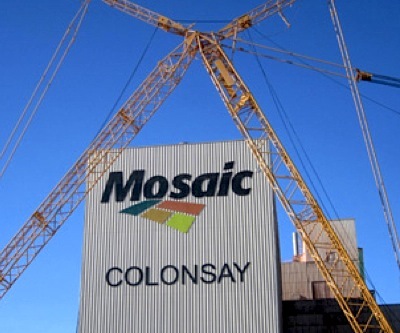 Mosaic operates a potash mining facility near Colonsay, Saskatchewan. U.S. fertilizer producer Mosaic (NYSE:MOS) said Monday it has reached a definitive agreement buy the Florida phosphate business of fellow fertilizer CF Industries (NYSE:CF) for $1.4 billion. The Minnesota-based company, until now primarily focused on potash, will pay $1.2 billion cash to acquire the South Pasture mine and related assets plus $200 million to fund CF’s asset retirement obligation. The acquisition is expected to add approximately $0.30 per share to Mosaic's 2015 earnings per share, excluding any debt financing costs and any changes to outstanding share count, the company said. The firm, member of Canpotex —a North American group, the world’s largest potash exporting— said CF will contribute with 1 million tonnes a year of ammonia, a nitrogen product used in making finished phosphate products. This will allow Mosaic to abandon its plans to build a $1.1-billion ammonia manufacturing plant in Faustina, Louisiana. Potash is one of the main ingredients for making agricultural fertilizer, which is used to promote crop growth. Phosphate and nitrogen are the other two key components. CF Industries was object of an unsuccessful hostile takeover attempt several years ago by Calgary-based Agrium Inc. (NYSE:AGU), another member of the Canpotex potash-marketing group. Shares in CF were trading almost 3.7% higher at $217.28 at 11:16 am ET.